We make it easy for you to deploy value selling tools. We study your solution’s messaging and your customers’ pains and shortcomings. We then compare your solution’s benefits to your customers’ needs and ensure your value proposition fits your customer segment. We conduct secondary research and gather customer proof points to validate your value proposition. Next we design and build value selling tools to quantify and present the value of your solution. Once the tools are ready, we engage with your marketing and sales leadership to show them how the Value Selling Methodology flows through the entire customer acquisition cycle. We teach your organization how to implement the methodology and effectively use the tools. We integrate with your marketing automation and CRM platforms and utilize advanced analytics to measure performance and make adjustments to keep the tools fresh and up to date. 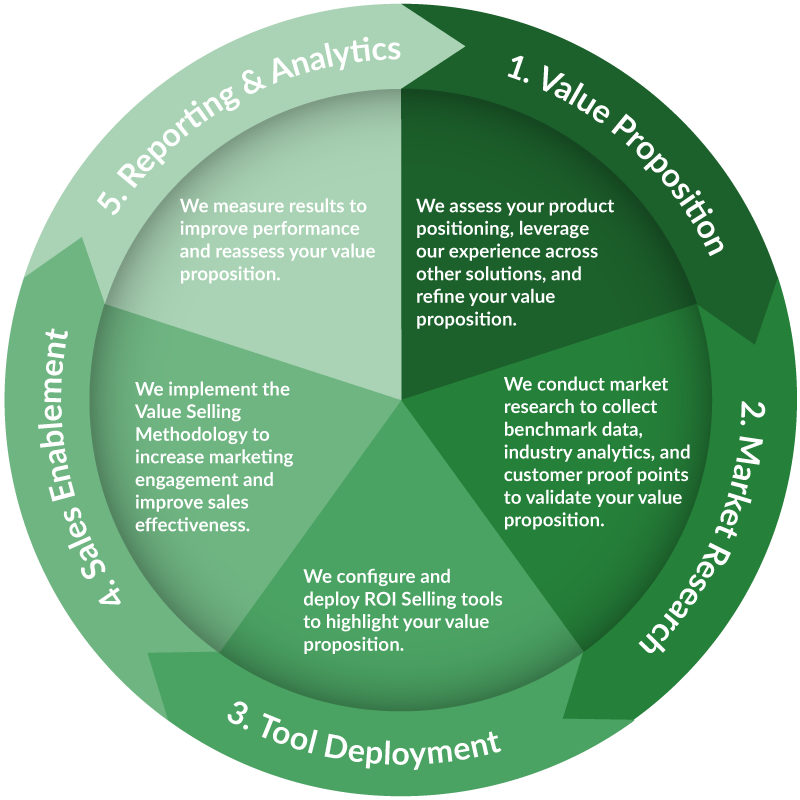 Our process brings additional objectivity and credibility to your value selling program. This increases internal adoption and believability by your customers. All we ask is that you give us a few hours of your time and any case studies, white papers, in-house research, and spreadsheets you might have. This is our standard process and not an expensive consulting engagement. Our turnkey process makes deploying value selling tools simple and affordable for you. The entire process takes about six weeks. Let us know if you need a ROI Selling tool sooner than that and we’ll see what we can do.